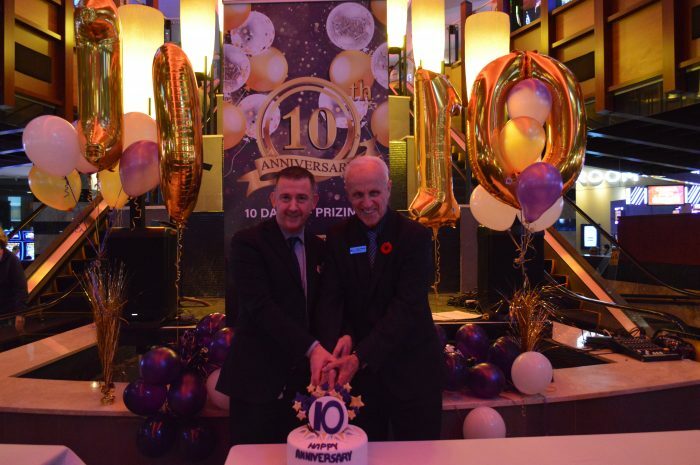 Grand Villa Burnaby, Gateway Casinos & Entertainment (Gateway) flagship property, is celebrating its 10th anniversary with 10 days of celebrations with customers and community and a look back on a successful decade as one of the province’s most successful casino resorts. Grand Villa is Gateway’s most premium brand, Grand Villa Burnaby was the first to feature this brand with the highest level of fit and finish with décor and design inspired by the casual-sophistication of an Italian Villa. Following a two-year build and an original investment of $180 million, Grand Villa Burnaby officially opened its’ doors to the public on November 5th, 2008. To mark the 10th anniversary, the property has undergone a spectacular renovation including an expansion and refresh of the gaming floor with new VIP and poker rooms, the addition of Gateway’s signature food and beverage brands Atlas Steak + Fish and Chow Lucky Noodle Bar, as well as Villa Bistro. The Delta Hotels Burnaby Conference Centre, adjacent to the Grand Villa Casino, also received a complete refresh of 189 hotel rooms and convention public spaces. “With a $15 million investment, we now offer an incomparable gaming experience featuring 1,200 slots, 64 table games, and 11 poker tables in our newly renovated property. This has given us an increased capacity allowing for greater visitation and with a total of nine dining options and restaurants, we are able to provide a more well rounded and elevated experience to all of our guests,” said Rowland England, Gateway’s Vice President of Operations BC West. As the host municipality, The City of Burnaby has benefited by receiving a share of the net gaming revenue from Grand Villa Casino. In fiscal 2017/2018 the city received $11.7 million from revenue generated by the casino. Much of these funds are used for a variety of capital projects throughout the city. Through GatewayGives, the company’s charitable giving and community engagement program, Grand Villa Burnaby donates to local charitable and non-profit organisations throughout Burnaby, which totals more than $500,000 over the last decade going to worthy causes such as the Burnaby Hospice Society, Burnaby Family Life, Burnaby Hospital Foundation, Burnaby Firefighter Charitable Society, Greater Vancouver Food Bank, Rotary Coats for Kids, and CKNW Kids Fund. Gateway Casinos & Entertainment Limited (“Gateway”) is one of the largest and most diversified gaming companies in Canada. Operating in British Columbia, Edmonton and Ontario, Gateway has over 8,400 employees and operates 27 gaming properties with more than 380 tables, over 13,200 slots, 77 restaurants and bars and 561 hotel rooms. As the new service provider for the Central Gaming Bundle in Ontario, Gateway has brought two more properties and one new planned build in Wasaga Beach or Collingwood to the Gateway portfolio when fully implemented. A multi-pronged growth strategy has seen Gateway diversify and expand its product offering, including developing proprietary casino and restaurant brands, which has dramatically improved the gaming customer experience while attracting new customers. This includes brands like Match Eatery & Public House, Atlas Steak + Fish and the new Halley’s Club. In 2017, Gateway celebrated 25 years in the business of gaming and entertainment in Canada. Further information is available at www.gatewaycasinos.com.